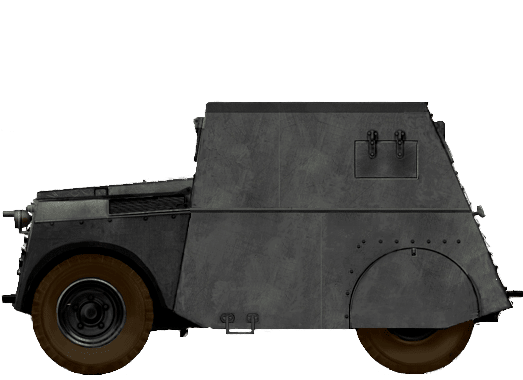 The Standard Beaverette was a small armored car designed and built in Great Britain during World War Two, in the early 1940s. 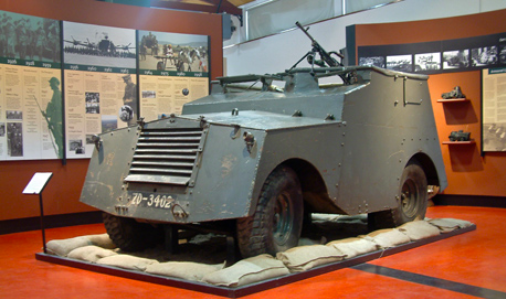 In 1943, halfway through World War Two – or ‘The Emergency’, as it was known in Eire – the Military of the Republic of Ireland, the Irish Defence Force (IDF, Irish: Fórsaí Cosanta, officially: Óglaigh na hÉireann), purchased 30 of these light armored cars to supplement the Irish Military’s rather small inventory of armored vehicles. Ten Mk. III and twenty Mk. IV Beaverettes were purchased by the Irish Army. The vehicles were designated as the ‘Mk. IX Armoured Car’ in the Irish Military, and were distributed amongst the Motor Squadrons of the Cavalry Corps (Irish: An Cór Marcra). The Cavalry Corps are the operators of the Irish Army’s armored vehicles. In theory, the Beaverette’s small size made it perfect for operation in a small country such as the Republic of Ireland, which is dominated by small villages and narrow country roads. However, much like its service in the British Army, the vehicle became somewhat loathed for its poor reliability, cramped interior and sluggish handling. On 1st September 1939, Nazi Germany launched its invasion of Poland, kickstarting the Second World War. In Ireland, this became known as “The Emergency” after the state of emergency that was imposed by the Irish Government and which was to last for the duration of the conflict. Officially, Ireland was a neutral party during the War but had slight leanings towards the Allies. Although Ireland as a state never joined the war, Irish individuals did fight in the war. The island of Ireland was also not untouched by the war, however, as both the Republic’s capital, Dublin, and Belfast, the capital of Northern Ireland, were bombed by the German Luftwaffe. 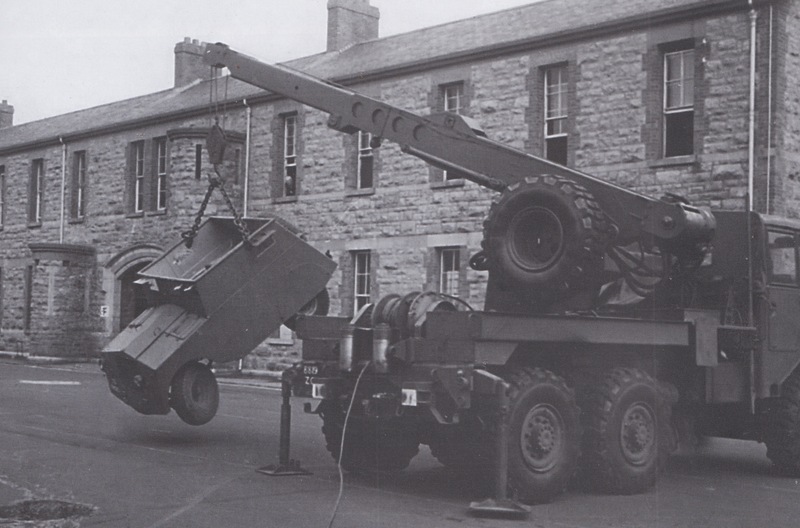 During this time, the Irish Army had few new armored vehicles to its name. Its inventory included, among other things, two Swedish L-60 light tanks produced by Landsverk, a small amount of British Rolls-Royce armored cars, and a large number of Universal Carriers, also from Britain. The Standard Beaverette was something of an emergency measure. With the British retreat from Dunkirk in the Summer of 1940, the British Army lost most of its armored vehicles, which were simply abandoned in France. To compensate, a plan was hatched to produce a simple, easily made armored car. Lord Beaverbrook, Minister of Aircraft Production, went to the Standard Car company with the idea of producing these vehicles, based on their existing saloon car chassis. These cars were called the Standard Beaverette, named after Lord Beaverbrook. The ‘ette’ part of the name was a play on the word tankette, a small tracked armored vehicle armed with at most a machine gun. Almost 3,000 cars were built spread between Mk. Is to Mk. IVs. It was the Mk. III and IV Beaverette that was purchased by the Irish. The Mk. III and IV were small, squat, boxy cars. They consisted of a projecting, jeep-like bonnet attached to a larger box section that formed the two-man crew compartment. Armor on the vehicle was just .4 of an inch (12mm) thick. This was enough to protect from small-arms fire and shrapnel, but not much more. They were light vehicles, weighing in at 2.9 tons (2.6 tonnes). They were 10 feet 2 inches (3 meters) long, 5 feet 8 inches (1.7 meters) wide, and 6 feet 10 inches (2.1 meters) high (including the small turret). This turret would carry the vehicle’s main armament of a .303 machine gun. This would usually consist of a Bren, Vickers or Lewis light machine gun. The car was powered by a 46hp Standard 4-cylinder petrol engine. The vehicle managed a top speed of just 20 mph (32 km/h) and had only front-wheel drive. A special reduction gear was added to the rear axle to try and compensate for this, but it had a detrimental effect on the vehicle’s overall speed. The vehicle rolled on heavy 9 inch (22 cm) wide tires. These were excellent for grip but made steering heavy for the driver. The only real difference between the Mk. III and IV was the front of the cab. The Mk. III had a flat front with two vision ports for the driver and gunner. The cab of the Mk. IV was stepped and featured three vision ports, one for the driver, two for the gunner. Across Britain, the Beaverette was parceled out to Home Defense units of the British Army, airfield security units of the Royal Air Force (RAF), and finally, the Home Guard. It was found to be obsolete by 1943, and as such sold on to other countries including Ireland. For the majority of their service, the Beaverettes were painted in the standard, solid ‘Quaker Grey’ livery that adorned Irish Armoured Vehicles from the 1920s to the 1950s. The Irish Military considered them ‘Light Reconnaissance Vehicles’. Fourteen of the Beaverettes were placed in service with the 4th Armoured Squadron who, in 1943, replaced the Universal ‘Bren’ Carrier equipped Cavalry Corps Carrier Squadron. The remaining 13 vehicles were divided between the Cavalry Corps’ Motor squadrons. At the end of ‘The Emergency’, the 4th Armoured Squadron was disbanded, and its Beaverettes distributed between various units to be used in support, but mostly training roles. Between 1951 and 1953, all 30 Beaverettes went through a conversion program and were turned into ‘Scout Cars’. This was an easy modification which saw the roof and accompanying turret completely removed. 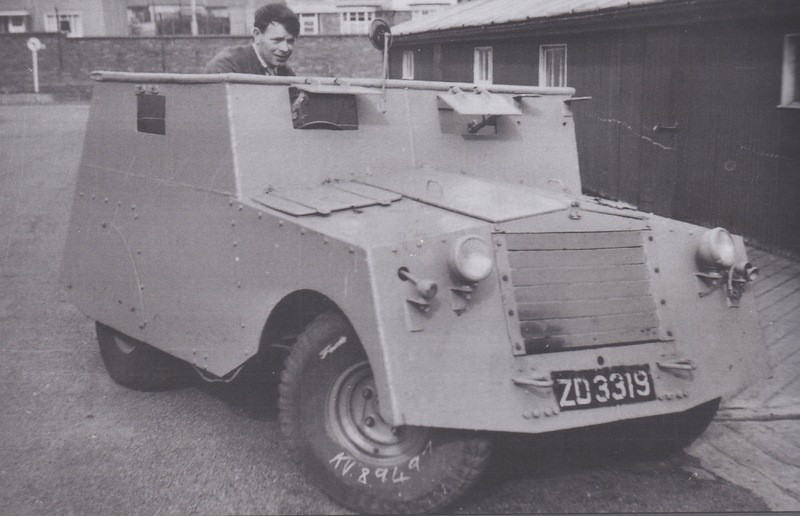 As scout cars, they would have a completely open top providing excellent vision, but no protection from bad weather (a common feature in the Republic of Ireland), let alone bullets or shrapnel. The removal of the turret and roof cut the overall height of the car down to just 4 feet 10 inches (1.4 m). Under where the turret would have been, a simple map table was placed. This table could also carry a No. 19 wireless radio set. The newly designated scout cars were spread around various Cavalry Corps units. Four were placed into service with the 1st Armoured Car Squadron and the 3rd, 5th and 11th Motor Squadrons. The remaining 14 were kept at Cavalry Corps vehicle depots. The Beaverettes were finally retired in 1965. They remained in service for so long simply because the Irish Army had nothing better to replace them with. A Mk. III Beaverette that has been converted into the scout car role with the turret removed. The vehicle is painted in the typical ‘Quaker Grey’ paint scheme of the period. This illustration was produced by Leander Jobse, based on work by David Bocquelet, sponsored by our Patreon Campaign. Only a small number of the Irish Beaverettes survive today. The Cavalry Corps Museum, the Curragh in County Kildare, holds the only running example of an Irish Beaverette, a Mk. III that is often run in parades. They also have a preserved Mk. IV inside the museum with a preserved interior. Interestingly, an Irish Beaverette can also be found in England. The Mk. III Standard Beaverette kept at the Cobbaton Combat Museum in North Devon was once used by the Irish Army. Like the rest of the Cars, this example had its roof and turret removed to turn it into a scout car. The museum manufactured a replacement roof and turret for the vehicle to restore it to its original configuration. As it did in the British Army, the Beaverette simply filled a need in the Irish Military for a light armored car when little else was available. While it was a mostly loathed little car, it served its purpose in the Irish Military for over 20 years. They bought many vehicles from Britain over the years. Have a look at out other Irish articles.